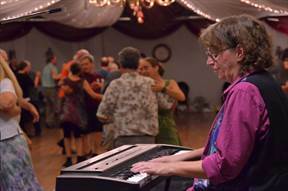 Contra dancing is participatory American folk dancing — vigorous and enthusiastic. Contra dances feature “live music” every time — Irish fiddle music, Old Time fiddle music or some “wild derivation.” Fun and easy to do, each dance is taught before the music begins. Our typical evening dance is held 1st and 3rd Fridays with an easy lesson beginning at 7:15 p.m. All are welcome, and no partner is needed. Light refreshments are provided during the breaks. Avalon Ballroom, 6185 Arapahoe Road, Boulder. 1st and 3rd Fridays. Lesson 7:15. Dancing 8 – 11 p.m. $10 / $8 members / $5 students / $2 children 12&under (prices may vary for special events). Call Teri at 720-352-1770 for more info. Shoes with clean soles are mandatory.